John F. Kennedy was sworn in as President 50 years ago today. It was 50 years ago today that the Irish in America and in Ireland celebrated one of their own taking the oath of the most powerful position in the most powerful country on Earth. They celebrated the fact that Catholicism and roots in the severe poverty of Ireland's past were no longer a bar to the most powerful positions in American society. In other words, Irish Catholics had achieved great success and the Presidency was just the last remaining prize to be won. With hindsight it's clear that by the 1950s Irish-America was too successful, too interwoven into American society to be denied that aspiration. The Presidency was almost inevitable, even though for many older Irish-Americans Kennedy's inauguration was something they thought they would never see. I doubt younger Irish-Americans felt so distant from the American mainstream that they thought the Presidency was off-limits to them. Although Irish-Americans were achieving great things in the 1950s, Ireland was still a poor and insular country. A large percentage of the population was still subsistence farming. Television was almost non-existent. Even electricity wasn't yet universal. The post-war boom had passed Ireland by. 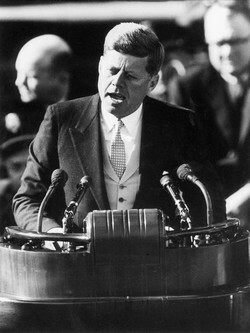 Then on January 20, 1961 one of Ireland's sons, a 'cousin' of theirs, was sworn in as President of the United States. It's almost as if at that moment, Kennedy accepting the duties of the Presidency, a veil was removed from Irish people's eyes and a weight was lifted from their shoulders. A whole nation suddenly stood upright and saw clearly that anything was possible. Six months later Kennedy was dead. Yet, Kennedy's death didn't signal the end of Ireland's new found self-belief. Instead the country enjoyed economic success and for the first time imagined that people wouldn't have to leave Ireland to find opportunities elsewhere. The 60s were the first truly successful post-independence years in Ireland. It has been a roller-coaster ride since then with great boom times and shockingly hard times, as we have now. These hard times are not, however, due to a lack of self-belief or a sense that Ireland will always be a poor country as was the case before 1960. No, despite today's great hardships and upheaval, Irish people know full well what they're capable of. JFK demonstrated that to them in 1961.